On October 16th, 2010 the first annual DOCTRID International Interdisciplinary Conference was launched after many months of planning. To mark the inaugural launch of the conference a signing ceremony kicked off the conference in which Daughters of Charity and five universities (Dublin City University, Michigan State University, Royal College of Surgeons in Ireland, University College Dublin, and University of Limerick.) signed a Letter of Memoranda launching the new Research Center for Intellectual Disability. 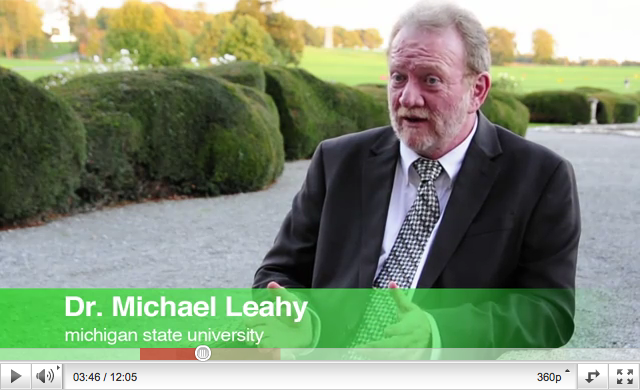 I had the great pleasure of being invited to this truly amazing conference to capture the story behind the conference and research institute in a short documentary. As a one man documentary crew I had to capture the best possible video and audio with very modest equipment and time. This filming was my first official documentary shoot, and it was a wonderful experience in both the personal interactions with the wonderful people involved as well as the technical challenge of filming and capturing the story of this monumental conference. Since I knew going into this project it would be a one man job from start to finish I had to ensure that I planned as much of the shoot ahead of time as I could. I was able to work with conference organizers ahead of time to get an understanding of the flow of the conference and who would and would not be available for comment. Given the platform of the conference and the unique challenge of shooting such a highly mobile documentary on a one-day-one-take type of scenario I had to carefully choose my equipment. To meet the needs of the documentary and to also stay within my shoestring budget I had to choose very carefully the right tools for this job. More on the exact equipment used below. For this job I decided to go with a DSLR rig to ensure that I would get the highest quality images and sound with the maximum mobility needed for me to move from one area of the conference to another and setup quickly to capture the interviews and b-roll footage. The equipment I chose to take for this shoot was really simple, as that was one of the constraints and challenges of having barely any budget to accomplish the shoot. For this job I used a DSLR rig setup for highly mobile video and on board audio recording and a pocket full of class 10 SDHC cards and Nikon EL3e batteries. The camera I used was my trusty Nikon D300s with the Zacuto Z-finder and Rode Shotgun Microphone. This setup allowed me to both hand carry and tripod mount the camera to capture an amazingly clear high def image at 720p and as well as capture high quality stereo audio without having to use wireless mics. The Zacuto Z-finder proved to be invaluable as it allowed me to ensure tack sharp pull focusing (since the D300s does not have auto focus on video) and magnified the LCD to 3 times its native size. The only draw back to the Z-Finder I had to deal with was one I caused myself by not ensuring I had the correct mounting bracket to work in conjunction with my battery grip, so I had to loose the battery grip while filming which turned out not to be too much of an issue but did mean that I had to carry a bunch of batteries in my pocket. The Rode Mic performed wonderfully, I am still amazed at audio quality that mic is able to capture, even at a distance. Being able to rely solely on a shotgun mic for audio was crucial given the fast paced, limited time I had with each interview, setting up each person with a wireless mic was not an option, nor did I have an audio controller to monitor the audio levels. While it would have been ideal to run a seperate audio capture the entire time with controlled audio levels etc. it was just not in the cards for this shoot, and I can't say enough how happy I was with how the Rode Mic performed. the biggest challenge for this shoot was that I only had one shot to get it right. Since this entire documentary was to be filmed on one day while the conference was going on live, I had to execute my filming plan without the chance to "redo" any of the shoots or interviews. While looking back, there are about a million things I would do differently, but that always seems to be the case. Fortunately I was able to get most of the interviews planned and I did not run into any technical difficulties. The second biggest challenge was to edit all of the interviews I had gathered down to a reasonable 10-15 min time frame. This of course, took many hours of red eyed editing late into the night. After many hours and a few consults to the conference organizers I finally released the final version of the video. I was thrilled to coordinate with the folks form Fegan Films in Ireland to supply them with a finished European version (PAL) of the video to be incorporated into a published DVD of the conference. I am very proud to have a finished piece of film on a published DVD along with the fantastic work conducted by Fegan Films. Hopefully this is the first of many more short subject documentaries to come. For More information on DOCTRID conference please visit their offcial website at www.doctrid.com. The data we collected was from the online course scheduling website provided by Michigan State University. At the time of this study (Spring of 2008) we only had data that went back to fall of 2003. Once we had the data we were able to construct a series of graphs that showed the overall enrollment as well as the semester and course breakdown. When viewed on the original site, the user can click through the various semesters to see a more detialed makeup of the enrollment per semester. Using the data collected we were able to build a detailed graph of enrollment broken down by semester, and then further identified by department offerings within the college. 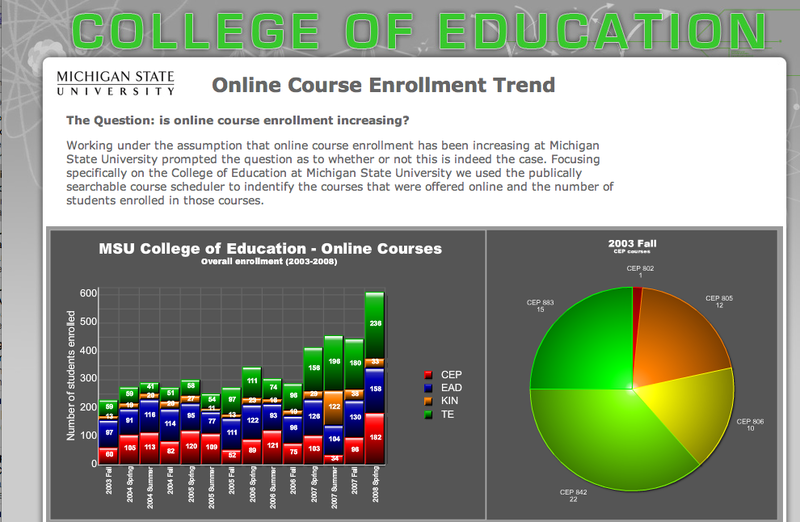 As seen in the graph below there is distinctive trend of increasing online course enrollments within the College of Education. Of the varying departments within the college, it appears as though the Teacher Education program is growing at the largest rate. It is my intention to revisit this research in the coming year to further investigate the trend. It would also be beneficial to broaden the scope to include more colleges across the university to get a more generalizable result to the university setting as a whole.